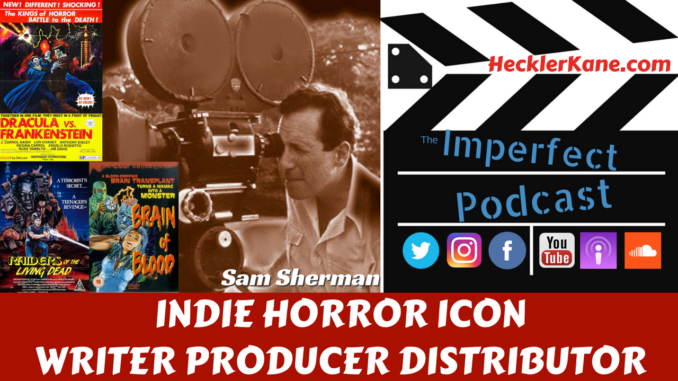 This week we take the Imperfect Podcast on the road with horror icon, Sam Sherman. Sam is has been a writer, producer and distributor that continues to work in the film industry today. We were fortunate enough to be introduced by our friend Ethan Marten who you may remember from our podcast about Eyes of the Roshi. Sam Sherman attended New York’s City College Film Institute, where he ran “Flash Gordon” serials and “The Mask of Fu Mancho” in the student film program and made the 16mm short “The Weird Stranger” in a single day. The first picture he distributed was a re-release of The Scarlet Letter (1934) in 1964. He also worked in the publicity department of Hemisphere Pictures prior to forming the hugely successful production and distribution outfit Independent-International Pictures with Do-It-Yourself indie filmmaker ‘Al Adamson (I)’ in 1968. Independent-International produced and/or released a slew of movies in such genres as horror, Western, science fiction, comedy, action and even blaxploitation for the drive-in market throughout the 1960s, 1970s and 1980s. Sam is a humble, intelligent film maker who gravitates toward “the weird.” We couldn’t have asked for a better opportunity to learn from someone who made his mark in the film industry as an independent for decades. Part of 1 of this interview discusses Sam Sherman’s background and early career. Stay tuned next week for Part 2. Where did your love of movie making come from? It started with a love of still photography then in whole movie photography. I had been given my uncles 8mm camera and projector. I started making my own 8mm movies and also started collecting movies like Charlie Chaplin and westerns. When I started going to the movies at the age of 4 I always had a love for it. First time I was in a theater, what impressed me was how enormous the screen was and that was before TV or home movies. Television started running old films that I took a liking to which took me in that direction. I basically started as a collector of movies. Regular 8mm, short 5 and 15 min films and then I got a 16mm projector for movies that ran longer. At that time there was no home video and I wanted to have certain movies I could see and preserve. I thought a lot of them were so obscure that if I didn’t have them nobody would have them. Through all of that I became a film historian, studying the history of films going back to the late 1800s. I was hired by James Warren who produced the Famous Monsters of Film Land as a writer and film historian. He had an editor but couldn’t keep up with everything so they would farm out articles to me. Along the way I got to interview many directors, producers and actors. I was always interested in the more obscure films but I did get meet famous people such as John Wayne. John Wayne liked me because I knew all about his early work as a young man starting out. He couldn’t believe I had all of his films on 16mm prints. At that time actors or producers would have 35mm screening rooms in their homes and didn’t even know these 16mm prints existed that you could run yourself. I got to meet John Wayne over a dozen times in different circumstances. I sat with for an interview article from 8am until 1pm. No acting, just shooting the breeze about old 1930’s pictures. He couldn’t believe some of the facts I knew about those old films like the time they were shooting live ammo on set. I had a good friend Joe Franklin who had a television show in NYC and he helped me with a lot of things whether it was getting to do a film or meeting someone. He knew just about everyone in the industry. What was the first independent horror you filmed? It’s a funny how that happened. Things like that don’t get planned. If I had said I’d like to make horror films it doesn’t happen like that. There’s always a million impediments to you doing something. I was a big fan of photography and I subscribed to a popular photography magazine. There was an article about City College Film Institute that seemed interesting. A place to learn about making films, use equipment, and meet people. To get into the film program you had to have top grades and be a science student which I was. That gave me an in because I was a step up from the average student in the New York area. It was a free school if you got there. At the time, other schools that taught film were on the west coast like UCLA & USC and it was too costly for my family to send me to California. I was also very young because I skipped two grades. I was 16 and looked like I was 12 which was hard to get people to experience me. I was going to college and working as a film editor, projectionist and teaching audio/visual use at Hunger College, plus making my own little movies. The fact that I liked horror films came from two areas: One was comic books and they always had horror and in addition to that I would listen to radio programs. Most of the dramatic shows were in the mystery or horror genre. The weirder the better for me. That background and working for Famous Monsters of Film Land Magazine pushed me into horror. I was in charge of programming at City College and they came after me in the school newspaper and called me the ‘Horror Man: Sherman is lowering the standards of City College.” The head of the film institute was teaching a course and we had to make a small film to pass the class. It took most students almost 6 months to make their short films. Everyone else was pretty artsy and I was low class. The end of the semester was coming and I had nothing. He said to me I should make a horror film about a vampire who robs a blood bank. I end up making a film called The Weird Stranger. It was a crazy horror satire and it was technologically way ahead of what the others were doing. I had a full synchronized score that matched the moods and sound effects. As much as he hated it, the professor had to give me an A. What he hated the most was that I wouldn’t put the City College logo on the film. I shot my film on location, with my own equipment and had my own logo. It turned out to be the best film of the class and years later my sister was taking a course at City College and invited me to a screening. They announced they were going to show their favorite student film and it turns out they start showing my film The Weird Stranger. People loved it. Since I made the film, peoples taste changed. What makes horror films so unique and likeable? It’s because it’s different. Everything in life today, seems too similar and uninteresting but when you get to horror, you have the undead coming back to life or zombies or whatever. Way back when, not many were made. People wanted to see something different. How did you start making films professionally? I was friendly Irwin Pizor who owned a company called Hemisphere Pictures. They were located in New York with offices in the Philippines who had made one horror film but at the time I met them they were making war films because there was a big demand for them overseas in 1963. Make them in the Philippines and sell them around the world but they were making no money in the United States. I had bought a picture from Irwin Pizor based on Nathaniel Hawthorne’s The Scarlet Letter and I wanted to re-issue it.